A shell script is a sequence of commands for which you have a repeated use. This sequence is typically executed by entering the name of the script on the command line. Alternatively, you can use scripts to automate tasks using the cron facility. Another use for scripts is in the UNIX boot and shutdown procedure, where operation of daemons and services are defined in init scripts. To create a shell script, open a new empty file in your editor. Any text editor will do: vim, emacs, gedit, dtpad et cetera are all valid. You might want to chose a more advanced editor like vim or emacs, however, because these can be configured to recognize shell and Bash syntax and can be a great help in preventing those errors that beginners frequently make, such as forgetting brackets and semi-colons. You can add this setting to your .vimrc file to make it permanent. 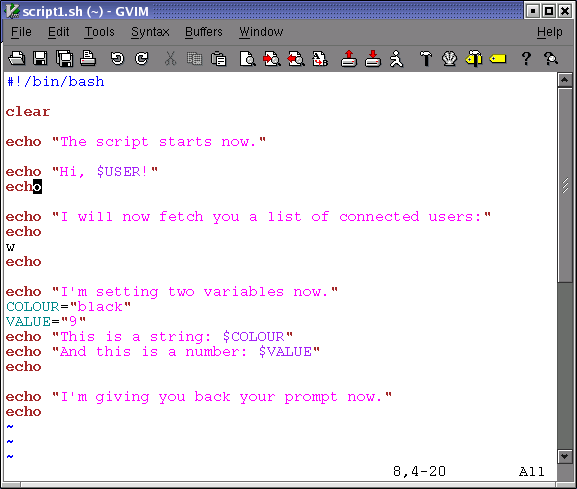 Put UNIX commands in the new empty file, like you would enter them on the command line. As discussed in the previous chapter (see Section 1.3), commands can be shell functions, shell built-ins, UNIX commands and other scripts. In this example we use the echo Bash built-in to inform the user about what is going to happen, before the task that will create the output is executed. It is strongly advised to inform users about what a script is doing, in order to prevent them from becoming nervous because the script is not doing anything. We will return to the subject of notifying users in Chapter 8. If you are just getting started with Bash, use a text editor that uses different colours for different shell constructs. Syntax highlighting is supported by vim, gvim, (x)emacs, kwrite and many other editors; check the documentation of your favorite editor. The prompts throughout this course vary depending on the author's mood. This resembles much more real life situations than the standard educational $ prompt. The only convention we stick to, is that the root prompt ends in a hash mark (#). This is the most common way to execute a script. It is preferred to execute the script like this in a subshell. The variables, functions and aliases created in this subshell are only known to the particular bash session of that subshell. When that shell exits and the parent regains control, everything is cleaned up and all changes to the state of the shell made by the script, are forgotten. The specified shell will start as a subshell of your current shell and execute the script. This is done when you want the script to start up with specific options or under specific conditions which are not specified in the script. The Bash source built-in is a synonym for the Bourne shell . (dot) command.